The cactus flower, it can be difficult to get spiky desert cactus to bloom when you keep them as houseplants. The reason is that cactus plants need desert-like conditions to stimulate good blooming. 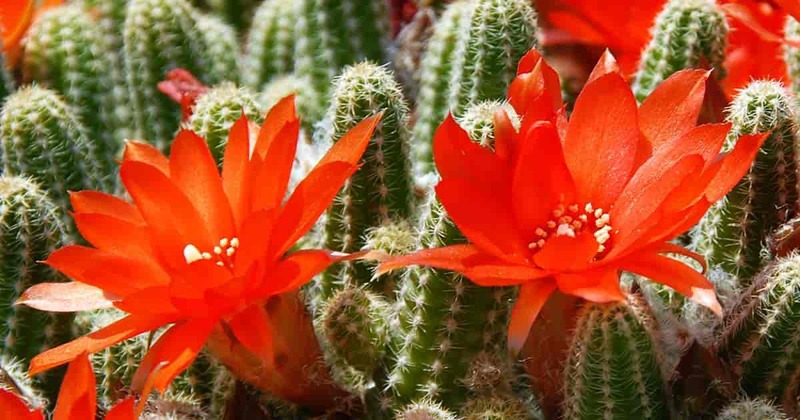 In this article, we share tips to help you create the right environment to stimulate both desert and holiday cacti to bloom. Soon you’ll be enjoying beautiful, interesting cactus blossoms all year round. Read on to learn more. How Do You Know Your Flowering Cactus Will Bloom? Desert cactus need bright, hot desert sunlight in order to bloom properly. They also need maturity and a regular period of dormancy in order to bloom. One of the best ways to know your cactus will bloom is to buy one that is already in bloom. This way you will know your cactus is mature enough for flowering. This also helps ensure that it is a variety that blooms fairly easily. Once home with your cactus, you need to provide the plant with the right environment to ensure annual blooming. Remember desert cactus needs bright, hot sunlight during the growing season and several months in a cooler, less bright spot during the winter. From around September to April, keep desert cactus in bright, indirect sunlight at about 50° degrees Fahrenheit and water sparingly or not at all. How Can You Simulate A Desert Environment For Cactus? What Temperature Does Blooming Cactus Plants Need? If you want your cactus to flower, you must keep it at the right temperature. Cacti grow actively and bloom during the hot summer months and take a break during the cool months of winter. If you want your plant to bloom enthusiastically during the springtime, you must keep it at the right cool temperature (50° degrees Fahrenheit) during the winter. While your plant rests, it will stop growing and devote its energies to creating flower buds. In the springtime, you can gradually raise the temperature around your plant. The majority of cacti like very hot temperatures and can be transitioned from a more sheltered indoor setting to full sun and full exposure in the spring and summer. Keep your indoor cactus in a south-facing window where they will receive ample sunlight. This can also be a good spot in wintertime because the sunlight will naturally not be quite as bright. Furthermore, the temperature next to the window will probably be cooler than the temperature in the rest of your house. Of course, you will have to be the judge of that. How Much Light Does Your Cactus Need? If you keep your cactus and succulents in your outdoor garden during the growing season, position it so that it can get the maximum in heat and light. Plant or place it in direct sunlight, and be sure that it has good drainage to prevent root rot. How Much Water Does Cactus Houseplants Need? Even though cactus are extremely drought tolerant, they do need more water during the growing season (especially if you want them to bloom). Keep an eye on the soil, and when the top couple of inches dry out, water your cactus thoroughly. If it is in a container, let the water run through the pot and be sure to empty the drainage saucer to avoid having your plant sit in water. Your goal is to simulate a desert rainstorm that drenches the earth and is followed by bright sun that dries the soil quickly. Cactus at rest do not need to be watered. The soil should be allowed to dry thoroughly between scant waterings in the winter. Generally speaking, the moisture that the plant has stored should be adequate through the winter months. Misting is a good idea, though, as it discourages spider mites and provides good ambient moisture. A humidifier may be helpful. When and What Kind Of Fertilizer Does Cactus Need? Cactus do not need a lot of fertilizer. Only fertilize during the growing season, and only use a type of fertilizer that is especially designed for use with cactus. For good blooming, it should be low in nitrogen and high in potassium and phosphorus. What Is The Best Soil For Cactus? When you repot your cactus, you should also use a product that is especially designed for use with cactus. If you are unable to get a cactus potting mix, you can concoct your own by mixing equal parts potting soil, sand and perlite. After repotting, allow your plant to rest for a week before watering. Cactus flowers seem to be a treasure, springing forth from their thorny, humble parents. A comprehensive cactus collection can delight its caretaker with gorgeous blossoms in shades ranging from purest white, red, pink to the deepest purple. Some cacti flout large, showy blossoms while others are covered with tiny, delicate blooms. No matter which blooming cactus plants you choose, you are sure to be delighted by the scent and sight of the blossoms. In addition to seasonal delight, these plants offer easy care for the casual gardener. During the plant’s period of rest, you can rest too, and during it’s active period it needs little attention from you and rewards you greatly for the care you do provide. Most cacti produce flowers around the leaves or areoli. Some form flowers along the cactus ribs or warts. The flowers of the Mamillaria cactus form along the leaf axils or in the nooks and crannies that develop between the warts. Cactus flowers are like any others, consisting of petals, sepals, stigmas, stamens and anthers. Some very showy types display large numbers of bright petals and sepals. Some cactus flowers seem to grow from stalks, but this structure is actually an elongated ovary supporting the petals. 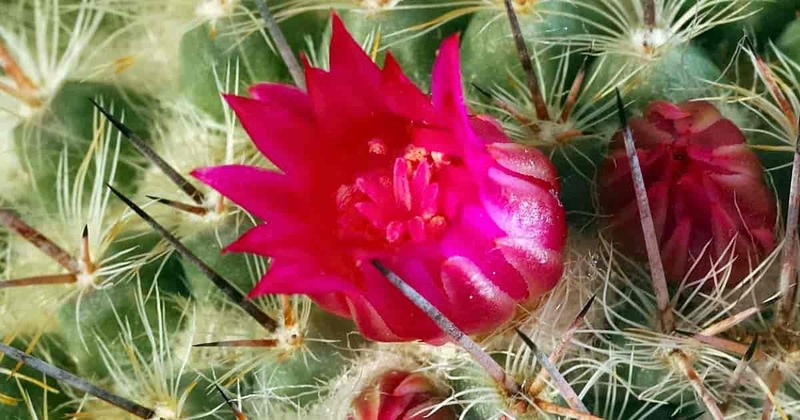 Most cactus flowers grow directly from the body of the plant. Flowers last varying lengths of time. Some bloom and wither within a twenty-four hour period. Others linger for a week or two. How Do You Get Christmas Cactus To Bloom? Cacti of the holiday cactus varieties (including Thanksgiving and Easter cactus) need different care than desert cactus. Desert cacti need watering that emulates a desert rainstorm. Woodland cactus or epiphytic cactus should be kept very slightly moist to encourage blossoms and good growth. After your holiday cactus flowers, you can let it rest thoroughly and withhold water unless the leaves start to wrinkle. After a period of rest, you will see new sprouts begin to form on your seasonal cactus. When you see this, you can start light watering. Increase the amount of water you provide when you see buds start to form. For Christmas cactus, this will be between September and October. When the buds appear, you must handle the plant with care. Don’t allow it to dry out, and don’t move it. Moving your plant around or allowing it to be exposed to drafts could cause the buds to fall. When you keep your Christmas cactus successfully, you can expect to enjoy pretty blossoms throughout the holiday season and into the early spring. What’s The Difference Between The Various Types Of Holiday Cacti? The cactus you see offered for sale just before the holidays is really more likely to be Thanksgiving Cactus than Christmas Cactus. The plants that bloom in late November are a species called Schlumbergera truncata. This species features leaves that have pointed lobes. Additionally the anthers (pollen producing part) of Thanksgiving cactus blooms are yellow. Genuine Christmas Cactus actually starts blooming in December. Its species is Schlumbergera x buckleyi. This is a hybrid variety that was developed in England during the 1840s. The leaves of this type of cactus are smooth with no pointy edges. The anthers of Christmas cactus blossoms are purple. Other than these small differences, these two types of holiday cactus are alike and can be cared for in much the same way. There is another variation on this type of cactus, known as Easter or spring cactus. As the name implies, it blooms readily in the springtime. You would manage all three of these types of cactus in the same manner, but you should schedule your manipulation of lighting and temperature to prompt blooming at the desired time. All of these species are long-lived. With good care, they can bloom year-after-year for decades. Sometimes families pass these holiday cacti down for several generations. How Do You Manage Light And Temperature To Produce Holiday Cactus Blooms? All of these plants can be spurred to bloom by shortening daylight hours and reducing the ambient temperature. The best range of temperatures to spur the development of flower buds is between 55 and 60 degrees for about six weeks. Keep the plants in this range, and you won’t have to worry too much about shortening the hours of daylight. If you want to manipulate lighting to induce blooming, put your plants in a room that has no source of artificial light for plants. Limit the amount of natural light the plants receive to 8-11 hours daily. If you must rely on artificial light, set timers to limit the amount to this period of time. You may be able to stimulate your plants to bloom a second time by withholding water after the first bloom has passed. Doing without water for a brief period of time after first bloom seems to be a mini-rest period that stimulates a second flush of blossoms. With all types of holiday cactus, you can force blooming at any time of year by lowering the temperature and keeping the plant in complete darkness for a period of 13-16 hours daily for about a month prior to the time when you want blooms. Once your buds start to form on your holiday cactus, take care to maintain a very stable environment and consistent stewardship. Do not move the plant, and protect it carefully from temperature extremes and drafts. Sudden changes can cause bud drop. Holiday cactus are very easy to grow and make great houseplants. They resist most diseases, but you must remember that they need different care than desert cacti. As tropical plants, they need more water and more humidity. Their soil should be high in nourishing organic matter. You should water well when the surface of the soil starts to feel dry rather than waiting until the top two inches are dry. With holiday cactus, you can use any good houseplant fertilizer in a half dose solution. While your holiday cacti are forming buds, provide water, but do not fertilize. Resume fertilizing when blooming begins. Holiday cactus do not need frequent repotting and actually bloom better when they are rootbound. If you need to repot, wait until the flower has quit blooming. If you want your holiday cactus to branch out, prune it occasionally. You can use the pruned or pinched off segments to grow new plants. Do this by rooting the segments in fresh potting soil or even in water. If you build your cactus collection carefully and learn to manipulate light and temperature skillfully, you can always have something in bloom. Naturally, you can enjoy your spiny desert cactus easily in the summertime. Care for your holiday cactus carefully, and you can enjoy Thanksgiving and Christmas cactus throughout the holiday season and Easter cactus in the early springtime. Among your desert cacti, some Mamillaria will begin blooming in February, and a variety known as the Mexican Snake Cactus (Aporocactus) blooms in April or May. Where Can You Find Cactus? As your interest in cactus grows, you will surely want to round out your collection with more challenging varieties. Join a gardening or cactus fanciers’ group so that you can trade cuttings with like-minded souls. Take care to collect cactus responsibly. Don’t add to the problem of species loss in the wild by purchasing from sellers who collect specimens in the wild. Always buy or trade with a responsible nursery or individuals who propagate their own cacti. Likewise, be careful not to introduce cactus into outdoor areas where they are likely to grow with wild abandon and become invasive. Cactus Collecting Can Be Addictive! These easy-care plants come in such a vast array of varieties. Cactus present so many different and beautiful blossoms, it is easy to fall in love with collecting them. Cactus can be desert dwellers or tropical. They may thrive in bright sun or part shade. Some like very hot locations and others will do well in a cooler setting. Some like drought conditions while others need moderate moisture. When you collect cactus, there is a lot to learn and a lot to gain. Once you’ve started your cactus and succulent collection, you’ll find it hard to stop, and luckily indulging yourself in cactus mania is an affordable and harmless addiction you can enjoy each day and for years to come.